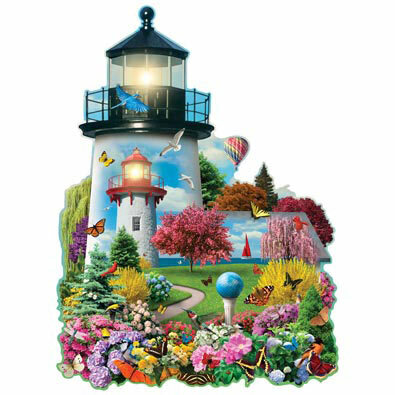 Lighthouse Garden is a 300 piece shaped jigsaw puzzle designed by artist Alan Giana. A bright spring view of the seaside life with colorful flowers, butterflies and birds. A striped hot air balloon floats in the distance above blooming cherry trees and a sailboat on the horizon.